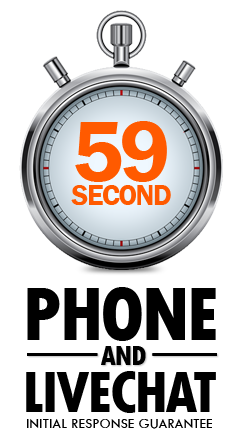 59 Second Guarantees Make the Liquid Web Promise Even More Heroic! Having long set the gold standard for quick response times and friendly knowledgeable service with our 30-minute ticket response and hardware replacement guarantees, Liquid Web has once again raised the bar on what is considered “fast” in Web Hosting. By adding 59 second guaranteed response times for phone calls and live chat to the SLA contained in our Heroic Promise, we’re taking one of the boldest documented steps to date in the battle to make downtime an extinct concept. 1000% Compensation Credited Exceeding Our SLA Commitment! Perhaps even more exciting for our users is the continued inclusion of 1000% compensation for downtime in the event we are ever unable to uphold our Heroic Promise. That means that if you wait even six minutes past our guarantee, you’re credited for a full hour. While many hosts will credit you for downtime, we are so confident in our Heroic Support we offer literally 10x the amount of credit exceeding our SLA commitment. In addition to the response times addressed in our Heroic Promise, this also includes 100% uptime and price lock guarantees. In the hosting world, a small fortune can be lost in the event downtime. Don’t wait for a second longer on hold or waiting for a live agent to take ownership of your problem. Our highly trained Heroic Support technicians are on-site, ready to support our Heroic Promise.